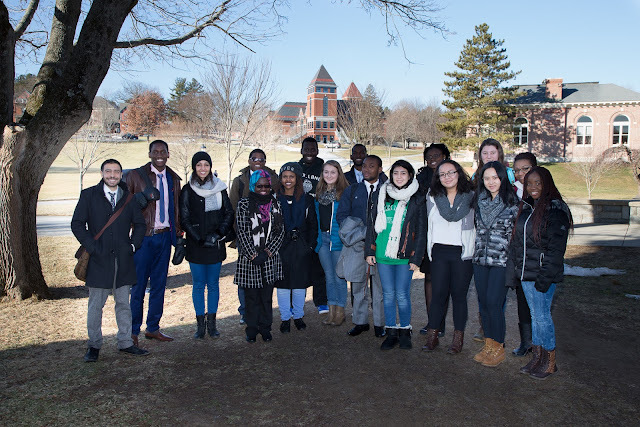 On Thursday, a delegation of eight students and one faculty member from African Leadership Academy (ALA) based in Johannesburg, South Africa visited NMH. ALA has students from across the African continent, and focuses on an entrepreneurial leadership curriculum that has many similarities to some of our programs at NMH, including our Rhodes Fellowship course in Social Entrepreneurship. Our two schools have connected in the past, most recently when a group of NMH students participated in ALA's first Model African Union conference in 2014. It was our pleasure to welcome this delegation, knowing that they had to travel two hours west from their conference in Boston. We look forward to further connecting our two schools! Below are a few reflections from our Rhodes fellows on their brief, but meaningful time spent with their ALA counterparts. Photo courtesy of Glenn Minshall. I have never felt so immediately connected to a group of people than I did to the students from ALA. Usually when you meet someone new you make small talk, and you don’t really talk about important things until you have spent all of this time talking about mundane topics that neither person really cares about. The students were refreshingly straightforward and honest in our conversation, and I learned so much about their school and cultures. I felt like we skipped over all of the unnecessary things that usually go into meeting and becoming comfortable with someone, and instead jumped right into the things we cared about. We talked about social entrepreneurship and social justice, about advocacy and how to approach issues in ways that do not alienate people. We connected over the similarities and differences of our two schools, being stressed, being surrounded by so many intelligent, motivated people, and finding ways to feel validated outside of the work that you do. They too are highly motivated students who are all working for a purpose. It is this kind of cultural exchange that is necessary if we are to work globally and across cultures to have a real impact on the world that we live in. Meeting the kids from ALA was an incredible experience. Times like these make me want to travel the world and do things outside of the NMH bubble. It was strange going back to class after spending three hours with them; the shock back to reality left the world suddenly very small. The students were impressive. They connected with us effortlessly. I was surprised how much I felt like I got to know them in such a small amount of time. In a lot of ways, they seemed so similar to us, even though they came from halfway across the world. Their values and ambitions were the same, and even many of their experiences, even though they were all implemented in a different place and context. I ate lunch next to a girl named Melanie, among others. She was the winner of their school’s enterprise contest in local schools. She implemented a recycling program in a local school that brought the school revenue, and organized a student run board to decide where this money would be spent. She, as well as other students, were also fascinated by our companies and enterprise ideas. It was valuable to hear their concerns and ideas about our projects. Someone asked about what issues we thought we were going to face, which was an astute way to tackle our concerns. It made me realize that having concerns is not a bad thing, but that the only way to get over possible hurdles is to look forward and realize what they might be. We agreed the importance of making friends and contacts in the field, of on the ground research and of listening to what a community means. She told a story of when they first went into the school, and noticed what they assumed to be issues, but when asked the students, they said they weren’t bothered by these, and went on to share what they did need help with. It was fascinating how much of their experiences were applicable to our journies. I think we all felt honored to be able to talk with such intellectually competent people and get to know how similar things are in the same field on the other side of the world. Their process and schooling, while different in many ways, was similar in the key steps. I think it validated the process we have been going through for us, and also made us realize how close we are to implementing these projects. At this point, it’s clear we need to just go out and try some things. We’re lucky that our class isn’t a competition as theirs is, as that sounded rather stressful for them, but I hope we can continue to have contact with the school. We all came away inspired by their sincerity, competence and ambition in the leadership field and as people in general. Meeting the students from ALA was a great learning experience. The school had a lot of similarities to our SE course. The students were very interested in the work that we did and very really fun to talk to. One of the students asked me “Who is Tyriq” after asking me my name and I had no idea what to say. I spent most of the lunch time talking with one of the students about New York as a place to live. It was surprising to me that she knew so much about New York (only Manhattan) and could talk just as much about it. Even though I love New York more than most cities in the world she made points that had me a bit reeled. The visiting students were some of the most friendly, interesting and intellectually stimulating people that I have ever met. When we went on tour, they asked about my classes, and unlike how you would imagine a visitor from across the world would react, they seemed genuinely interested. When we were entering Blake on the tour we got to talking about Social Entrepreneurship, and I was awed by both the fluent and nonchalant way they talked about Social Entrepreneurship as a whole, their projects, and their school’s curriculum. When I brought four visitors to philosophy class, it stirred my class out of our usual B-block-lecture haze. Kanye seemed to be the most involved student in the class; he took more notes than all of the NMHers and brought up the best objection to Ryan’s point that I heard all year. In philosophy we were talking about arguments for and against the existence of God, and we pursued this topic train as we walked back to the dining hall. I only wish that I could have talked with them more, and felt sad when I hugged them good-bye and walked back to class. I had a great time meeting with the students from ALA. I had a wide range of conversations, including Social Entrepreneurship, the history of Africa, and the legalization of all drugs. At first me and a girl from Tunisia talked about Social Entrepreneurship and New Americana. We also talked about how similar this class is to her entrepreneurial leadership classes. We compared our different problems we found and our different solutions. She talked about her other classes she liked, like the History of Africa. She explained that Tunisia has a lot of French influences, so they don’t really learn about Africa’s history in Tunisia. She also said she felt marginalized for the first part of her class, as her classmates, and even herself, for some reason, didn’t consider Tunisia as part of Africa. This was an interesting statement, but she further explained that as she rediscovered her roots, she was able to further appreciate the class. We then started to talk, with two other people, about Bernie Sanders, the presidential campaign, and the legalization of marijuana. This led to somebody posing the question what if all drugs are legal. We talked about this for a while, voicing our different opinions and viewpoints. It was a very interesting lunch and conversation time, because there are a lot of similarities between our Social Entrepreneurship class, and what their leadership classes are trying to accomplish. I found their school to be incredible impressive, with a five percent acceptance rate, and a whole different kind of diversity than what we are used to. I didn’t really know what to expect from the visit. Initially I decided to go on the tour with the ALA group because Grant asked me to. But I am so glad that I went. They were such amazing people. They were so open and friendly. I was so worried about initiating conversation and what to talk about but it came so easy, so naturally. A lot of my anxiety went away. I wanted to talk with each member of the group. They had so many questions about NMH and it felt nice to to answer them and hear about their experiences and their schools. My time with the ALA group was cut short due to a meeting that I had but the time I did share with them was incredible. I wanted to stay longer they had such interesting stories and this easy way of speaking that expressed genuine interest in what I was saying. I wish that they had stayed longer and that I could show them other aspects of NMH. They had such a creative way at looking at things I wish that I could have had time to talk to them about some of the issues surrounding diversity at NMH and how they might approach this problem and whether or not that was an issue they face at their school or have faced. It was refreshing to meet with people who came from a completely different country/completely different countries who had such interesting perspectives on our life at NMH. Half the world away from us, the students from African Leadership Academy and NMH shares many similarities that pertains to boarding schools. The girl, Eniola, that we spoke to has a very interesting background––born in the U.K, moved to Nigeria, and then admitted to ALA in South Africa. She is not the only one who comes from outside of the country. ALA has a diverse student body that represents both countries in Africa and countries in other continents. ALA also has very rigorous academics, and an exceptionally low acceptance rate. Most importantly, the students have similar concerns and dissension about their institution as we do. Eniola shared two interesting stories with us. The first one is a student uprising against a school rule that requires everyone to leave their dorm room at 7:10. The second one is an end-of-the-year conference that everyone participates in, and with the facilitation of a teacher, release what they really want to say at each other. This makes me realize how similar boarding school experience is although the geography and culture is entirely different. We are all dealing with the same issue, fledgling our new-found voices and attacking on the outmoded rules, navigating ourselves in the complex social network and practicing our soft skills, etc. The conference becomes very intense and dramatic at times, and I instinctively know it would not end up pretty, yet this is their ingenuity in tackling the issues on their campus. Eniola also inquired about the social experience at our separate institutions. The major take away for me is: when teenagers are tossed into a cage, they develop a dynamic that may or may not mimic the society. And what has caused this is a curiosity in all of our hearts. This is absolutely wonderful. It would be great if we can have an annual exchange with this group of students.